Beth Leonard’s greenhouse is the ‘go to’ spot in Welcome. Beth is best known for bedding plants, geraniums and ferns but she offers so much more. 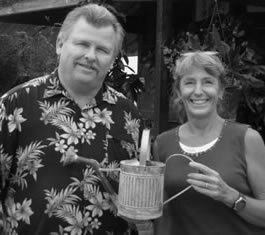 She mixes her own potting soil, creates funeral baskets, and her succulent dish gardens are a must have. Ninety eight percent of what Beth offers she grows herself. She began her business years ago so she could be home with her children. Since then she has expanded from one green house to three and, through word of mouth advertising, she has become the ‘go to’ plant place in Northern Davidson County. Dempsey Essick has created a beautiful painting featuring an assortment of Beth’s zinnias with an old 1940’s watering can (a hand me down from Beth’s mom), a faded garden sign, and two visiting goldfinches. 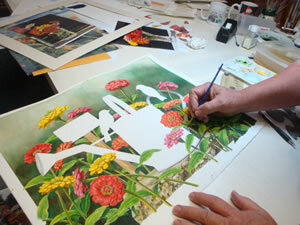 Dempsey is also known for his inclusion of a hidden rebus type hummingbird in his paintings. 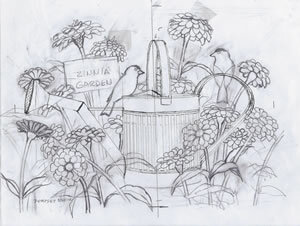 The one in “Zinnia Garden” is located in the lower right quadrant but you must look closely to find it. You can make Beth’s garden your very own, by having Dempsey add your name –at no charge– to the plant stake in the print. What a neat idea! "One of the places I love to visit is Beth Leonard’s Greenhouse here in the heart of Welcome. Beth is an artist at growing plants and creating beautiful potted arrangements. She has helped beautify the outside of my shop for years." "When I decided on doing a floral painting, Beth’s zinnias and watering can were the perfect compliment. I love zinnias and their colors are so strong that they seem to glow in the warm sunlight. 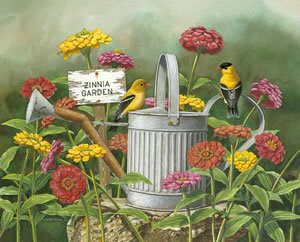 Goldfinches loves zinnias as well as they eat the seeds from the heart of the flower. They made the perfect match for the zinnias with their bright colors." "Zinnia Garden is a simple painting that I hope will bring back many memories of warm summer days with frolicking birds playing in the garden." "I think this painting calls for a sister piece- perhaps a similar setting in the fall. We will just have to wait and see." Visit Beth’s Greenhouse at 3629 Leonard Road in Lexington or call 336-731-7317.